Jenna received a BA in Art Practice with a minor in Celtic Studies from the University of California at Berkeley. It was during her time in college that she decided to begin her first novel, The Legend of Oescienne - The Finding. Reading such works as Beowulf, The Mabinogi and The Second Battle of Maige Tuired in her Scandinavian and Celtic Studies courses finally inspired her to start writing down her own tales of adventure and fantasy. Jenna also enjoys creating the many images and maps for her various worlds. Besides writing and drawing, she is often found reading, gardening, camping, hiking, bird watching, and practicing long sword fighting and archery using a long bow. She also loves getting feedback from readers, so feel free to send her a message any time. 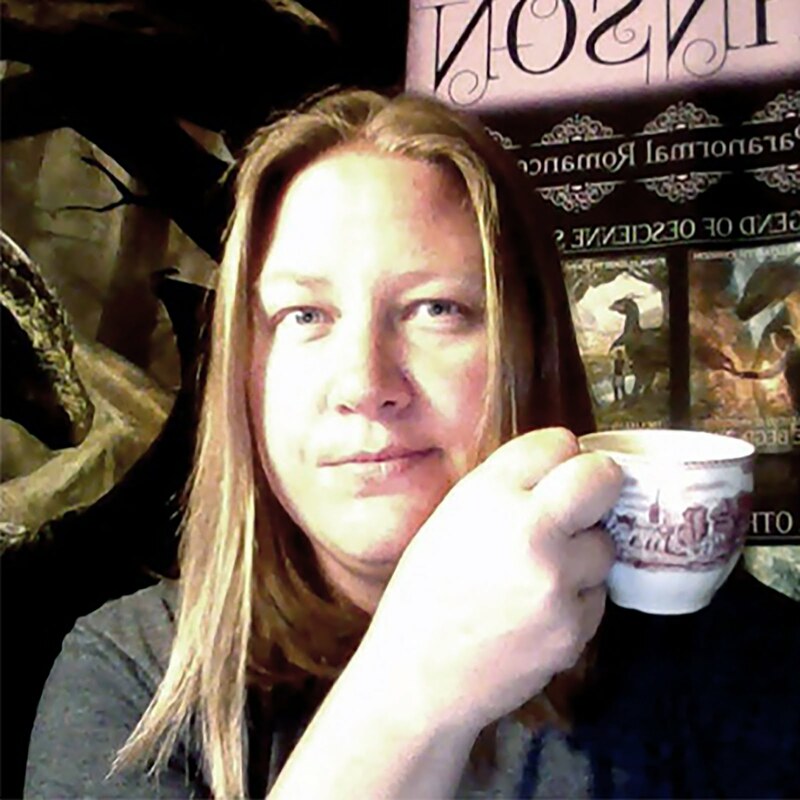 Jenna is currently working on the fifth book of her Oescienne series, as well as more novels and novellas in the Otherworld series, and any other book ideas that might come to her along the way. She can be reached at authorjejohnson@gmail.com. Also, if you would like to receive occasional updates on writing projects, special announcements and author appearances, and to be eligible for Jenna's Bimonthly Newsletter Giveaway, be sure to sign up for her Author's Newsletter. Thank you and I'm so glad to learn that someone from the area has found my books :). I love the Central Coast and, being a local yourself, you can probably understand why I chose it as the setting for both my current series ;). I hope you enjoy the other books and feel free to send me an email in the future if you have any other questions. Happy reading! On my Kindle I tried to reply when you asked for some POV ideas from Cade but it kept erasing, so hear I go again! I would love to hear his backstory about the castle and how he came to be there, although I am guessing we will maybe hear more of his story in book 3! Also what it felt like to bring and have Meghan there for the first time. Being a horsey person I think it would be fun to hear how he found (or was found by! )Speirling, and how they trained and grew together. I can imagine how much fun it would be to befriend a Faelorehn stallion! I'm definitely thinking of telling the story of how Cade managed to get Meridian for Meghan, but I never thought about his first meeting with Speirling . . . Will definitely have to keep that in mind; maybe have a special 'Animals and Spirit Guides' short story collection or post the shorter ones up here on the site ;). Thanks for the feedback! I agree with Neha....when will the third book be out?! In response to the question about the release of the paperback edition of Luathara: my editors are working on it right now. As soon as I get it back from them, I'll make the necessary fixes ~ I'm hoping that will happen in the next few weeks or so. Thanks for asking! I purchased your Otherworld Trilogy books at the Arroyo Grande Strawberry Festival this past year (2013).I LOVED LOVED LOVED them. I couldn't put them down and as soon as one was done I just had to pick up the next one. I was incredibly sad to have them end. It was refreshing to have a fiction story that wasn't about vampires and werewolves and was able to hold me captivated like this one did. I have recommended this story to all of my friends who read fiction and have had them all feel the same way. I look forward to seeing what else you write in the future and am now going to start your other series The Legend of Oescienne. I am definitely a huge fan. Thank you. I am so glad you enjoyed the Otherworld books (and thank you for the amazon.com review as well ;)). Don't worry, I'm not quite through with the Otherworld yet - I'm currently trying to finish Ghalien, the next Cade Novella, and I plan on a few more books and another trilogy focusing on secondary characters (just for starters). I hope you enjoy the Oescienne books as well and feel free to send me a message any time. Happy reading! IS THERE ANOTHER BOOK (ENDING) FOR THE OESCIENNE SERIES?? I HAVE LOOKED AND LOOKED,,HOPING TO FIND IT AND CANNOT FIND IT ANYWHERE,,,,PLEASE TELL ME IT DOESN'T JUST END WHEN THEY LEAVE LIDIAN....I AM 71 YEARS OLD AND READ VORACIOUSLY, AND I REALLY LOVE THIS SERIES. Hello! Yes, I do have TWO more books to write in the Oescienne series. I took a break after The Awakening to write the Otherworld Trilogy and I'm currently trying to get myself back into Oescienne mode ;). I have some of the fourth book written, and I'll be using the rest of spring and the summer to (hopefully) get book four finished. Hang in there and thank you for reading! Hello just wanted to write and say how much I enjoyed the Oescienne series. I'm a big fan of reading and I have been on the search for a very long time to find a good dragon book that would hold my attention like Eargon did. After stumbling upon the Finding I just had to buy the rest of the series. I hope we don't have to wait tooo long to find out what happens with Jahrra and Jaax. Keep up the good work and now I believe I will check out your otherworld trilogy as well :) Thank you for the awesome books! Hi Steph! Sorry to be responding to your question so late - Hopefully you won't have to wait too much longer for Oescienne, Book Four. I have the coming summer scheduled to work on it and I'm aiming to have it ready by the Autumn. Hopefully all will go well and it will be ready by then! In the mean time, happy reading!